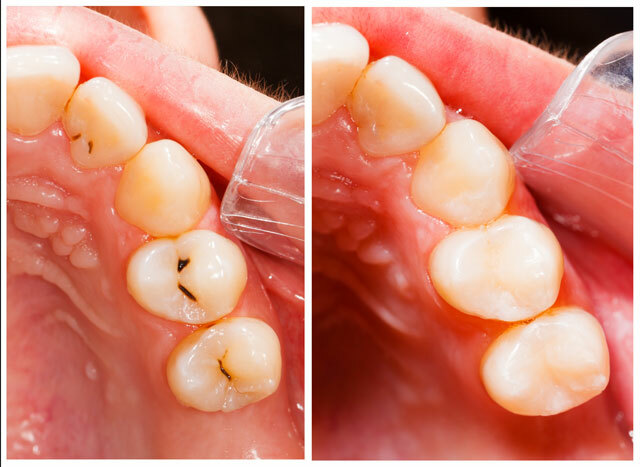 Tooth fillings repair the integrity and strength of a tooth that has a cavity. At Alpha Health Clinic, we use a tooth-coloured composite that subtly blends in with your other teeth. Not only are they more natural looking, they make your teeth stronger. Unlike the unattractive silver and gold fillings used in the past, white fillings offer a long-lasting solution with the added benefit of being mercury free and less susceptible to hot and cold sensitivities. Generally completed in just one visit, fillings offered at Alpha Health Clinic restore a tooth’s normal function and shape. It’s of most advantage to have a tooth filling placed as soon as damage is discovered, as bacteria promotes the decay of tooth structure. Having good oral hygiene goes a long way in preventing tooth decay – please speak to one of our dentist’s for other ways of avoiding destruction of tooth enamel resulting in the need for fillings. Tooth fillings are only as good as the dentist who places it and at Alpha Health Clinic you’re in the best hands. Help in maintaining fresh breath.